A hundred years after his encounter at Ravencroft Castle, Gerhold of Vilheim continues his crusade against the creatures of darkness and is hired to investigate a disturbing phenomenon on the borders of a long forgotten kingdom. 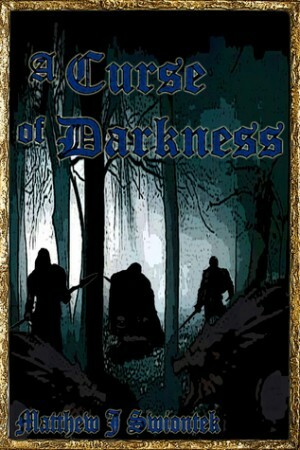 A darkness is spreading across the land and with it an ancient curse. Gerhold is forced to make his way through a haunted forest and uncover the secrets that lie within or watch as all is devoured by the blackness. It did not take me long to get back into this dark universe. I was kind of amazed at how easy it was to jump right back into Gerhold's adventures. This world is full of vampires, slayers, werewolves and now necromancers- oh and apparently flying ships. As if it couldn't get any better throw in some necromancers and flying ships, that made it freaking amazing. This book picked up right where to last one left off, Jarrell writing down the tales of Gerhold's life from the journals that were provided to him by Ernhold- strange names I know. It picked up after Gerhold realizes he was betrayed and had a cursed amulet in his possession. A priest tries to help him but it is too late the curse has spread and Gerhold is now one of the creatures he hunts. Fast forward to a hundred years later and Gerhold is still living amongst the priests fighting and killing monsters. He is called upon to help a vigil to investigate what is causing the townsmen to disappear in a town close by. Okay so this was just as good as the first. Gerhold was an even better fighter thanks to his vampirism but still holds his faith and values. I liked that he didn't let it completely corrupt him like it would for most everyone else. I liked that he didn't look down upon mere mortals or think ill of those that looked down on him. He took each insult in stride knowing he could easily kill them if he wanted to. Rolan was a great character. He proved that just because he was young, he was not weak. He was a great fighter and looked up to Gerhold even knowing what he was. All the other warriors were jerks but just following orders. I didn't Andyn from the get go so I'm glad I'm such a good judge of character. I didn't see that ending coming, that was quite the plot twist. It makes me really excited for the next book to figure out if Gerhold ever finds Harkin again. He has to right? Anyway I recommend this series to anyone that wants a quick dark, paranormal read.